From the northern island of Borneo, comes the Betta Macrostoma. Also referred to as the Spotfin Betta, the Ikan Pelaga Brunei or the Brunei Beauty, this wild betta fish literally translates to “big mouth” because of its mouthbrooding nature. It was believed until 1981 that this fish was distinct until it was re-discovered in a waterfall pool. The International Union for Conservation of Nature and Natural Resources (IUCN) has placed it on the Red List for “vulnerable”. These fish are naturally found in Brunei Darsm, Indonesia. In fact, they have been found living in waterfall pools in the rain forests. Keep reading for a few interesting facts about the Betta Macrostoma. Here is some information that will help you, in the event that you decide to house some yourself. If you decide one day that you want to try and keep one yourself, you will want to keep them in pairs, in species tanks and community tanks. You can house pairs in a 20 gallon tank, groups in a 40 gallon tank or higher. Pairs need to be given cover like plants and caves. In pair or species situations, fry might be discovered in the tanks, so remove a brooding male to avoid this. Many people have noticed that the fry appear seemingly without warning. The temperature range for their water should be between 75 degrees and 78 degrees Fahrenheit. These fish are omnivorous and they survive well on diets of bloodworms, frozen beef heart, brine shrimp, as well as daphnia. If you own one, it is imperative to keep the tank covered because they are extremely strong swimmers. Even the smallest opening will give you the chance to see why this fish is known as an indigenous jumper, as it jumps right out of its tank. During courtship and spawning you will see highly contrasted black and white markings on the males. On the females you will see prominent horizontal stripes across the body. You will also notice two dots around the mouth, a round and gravid belly, and a change in swimming patterns to complement the submission clamping of her fins. The Marcrostoma is a paternal mouthbrooder which means the male incubates from 12-17 days. Incubation time will vary with water temperatures. The females initiate spawning in soft water with a pH below 6. All in all, the Betta Macrostoma is yet another amazing betta and we’re glad to include it in our archive. However, housing one is not for the faint of heart. 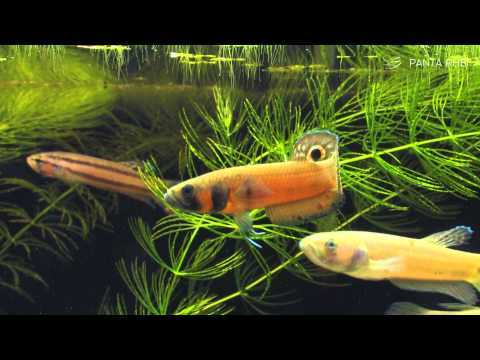 They are definitely more vulnerable than your standard betta and many aquarists believe that you should only house them yourself if you plan on rehabilitating one or possibly for research purposes. I can’t comment on that since I haven’t owned one myself. This information was posted for information purposes only. If you do have experience with this type of betta and maybe have some information to add, I’d love to hear from you. Just use the comment box below. If you are looking for new betta fish to own, check out our post “Best Places To Find Betta Fish For Sale Online“. Until next time! If you need any betta supplies, check out our Shop before you leave, or check out our Types of Betta Fish section for info on other neat betta fish.